Your tattoo foot pedal may seem like something unworthy of important consideration. However, it plays a ​vital role when it comes to creating your art because it affects how you work. The thing to remember is that repetitive actions like ankle movement take a toll. 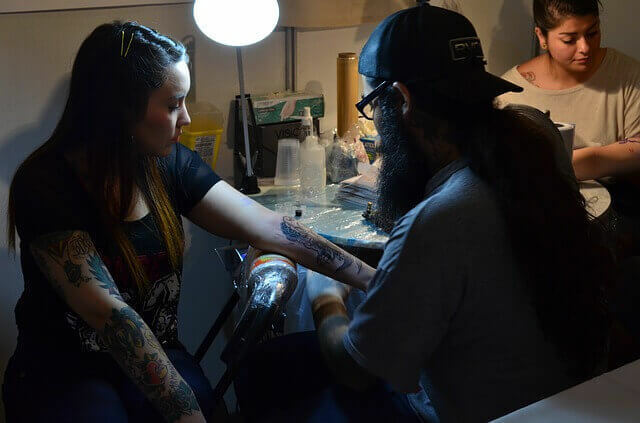 A good choice is a must for anyone serious about tattooing. Check out our best 5 list below with mini reviews also included. 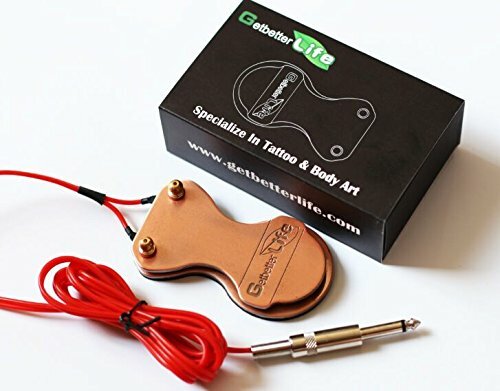 The Getbetterlife Pro Iron Tattoo Foot Pedal was the most expensive of all the products we reviewed. However, it was the only one that included a lifetime warranty. So even though it was more than double the cost of the cheapest pedal, we could justify the higher price. The manufacturers boast of a product that is reliable with good conductivity. The foot pedal’s materials appear to back up that claim. Besides everything else, it’s a good-looking product. We liked the shape and the copper color. We’re all about making a good impression on our clients. Professional appearing products go a long way in making a statement about your business and your craft. 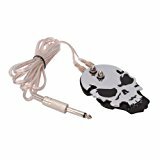 The Monster Point 360 Gem Tattoo Foot Pedal stood out by its design. As the company bills the product, you can access it in a full 360 degrees. We can see this product being a great complement to a table that swings all the way around too. This tattoo pedal was the only round one that we reviewed—and the heaviest. We liked the idea of not having to mess around straightening the pedal as we work because of its shape. We should point out that the chrome finish will show some wear after a while if that matters. That said, some artists may find it awkward to use because its design differs from a lot of standard pedals. It’s higher which may also take some time to get used to for some users. 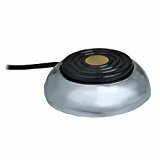 It is durable with a stainless-steel finish. It is a heavy pedal that will stay put. The one downside was the cord. It is a foot shorter than most of the models we reviewed. While it may not seem like a lot, it could make a big difference when you’re on the job. We were surprised by it, seeing as it sells itself with the 360-degree access. We must admit it; we liked the badass skull design. It seemed appropriate to take our creativity to our equipment as well. For that reason, we like the fact that it has a flat profile. You’ll only understand how important it is if you’ve been on the job. Awkward positions are hard on ankles. We also liked the fact that it has a non-skid, anti-marring base. The marring part might not be a deal breaker, but the non-skid feature certainly is. We want total control when we’re working. Anything that interferes with that requirement is off the list as far as we’re concerned. 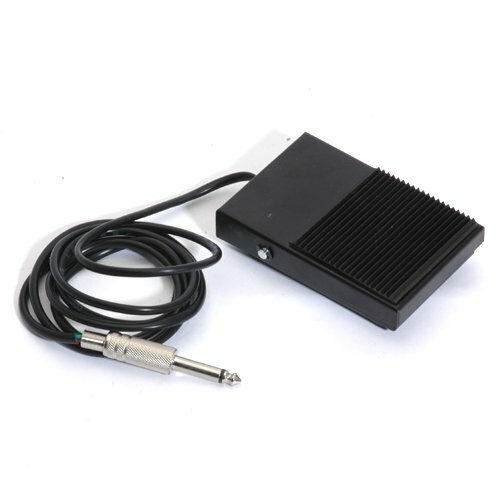 This Tattoo Power Supply Foot Pedal is essentially the same product as the previous one. It just comes in a different color. Given a choice, we like the black/silver combination better than the red. But that’s us. Whatever floats your boat, we say. It has a generous 5.5-foot cord which strikes a nice balance between too short and too long. After all, it isn’t just about you. You don’t want to have a cord that is too long that can trip your client in a bad way. Like the Monster Point Foot Pedal, the chrome finish will likely get scratched up after some use. It’s not a deal breaker, but it is something you should know upfront. It’s a minor aesthetic issue. We don’t mind if our equipment shows a bit of wear. The Tattoo Supplies Tattoo Foot Pedal is an old-school product that you’ll likely see in many of the 21,000 tattoo parlors around the country. It is a no-frills tattoo foot pedal with a standard square shape. It’s functional, albeit, a bit boring in its design. If it works, what more is there? 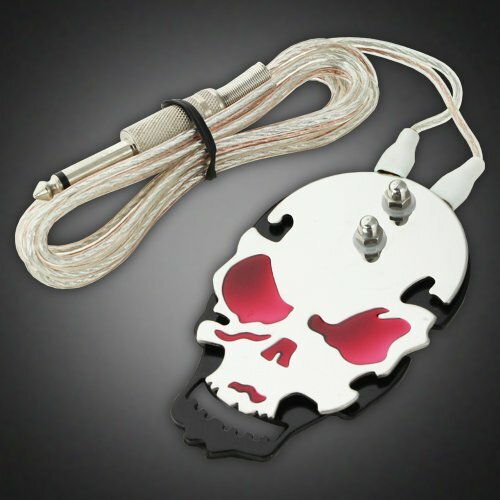 It has a higher profile more reminiscent of the Monster Point Tattoo Foot Pedal. You’ll have to work your ankle to use this pedal. It’s not a big deal for small jobs, but you may find that it gets annoying if you’re working on a longer job. This foot pedal was the cheapest of the ones we considered. It’s a good value for the price. If anything, it makes a good spare to have around in case your regular equipment goes down on you. It’s also an excellent choice if you use a portable tattoo chair since it’s lightweight. A tattoo foot pedal isn’t the most expensive thing you’ll buy for your business. But it’s the little things that can make a world of difference when it comes to your comfort level. Any pedal will do the job for short runs without making too much of a difference to your inking. However, when you work for longer stints, your comfort should be one of the primary considerations for any equipment you buy. If you’re not comfortable, it’ll affect your performance, and thus, your output. You can’t afford distractions when you’re on the job. Foot and ankle strain are brutal. But it doesn’t always end there. Repetitive movements like working a foot pedal have a nasty way of becoming worse and turning into back strain, especially if it’s affecting your posture. Do yourself a favor with a good choice. Using a tattoo foot pedal helps you keep the process under control so that you can do different techniques. From an artist perspective, a responsive foot pedal is a must-have. You’re going to have to change speed frequently, so it only makes sense that your pedal will make it easier. Your tattoo pedal, therefore, should stay in place as you’re using it. Make sure it has a non-slide surface so that it stays in place as you work. Your speed will likely change as you start to get into the process. You might put more pressure on your pedal without even knowing it. Check out the surface of the tattoo foot pedal too. You want a product that will grip your shoe so that you can stay in control. You should avoid getting a pedal with a slick surface that can cause your foot to slip off it. The circuitry is the nuts and bolts of a tattoo foot pedal. It should provide good conductivity and be resistant to short circuits. You should choose a foot pedal that strikes a nice balance between responsiveness and sensitivity. And don’t forget to find out the length of its cord. You know your tattoo station best. When you’re working, you don’t want any distractions. Make sure the cord is long enough to fit into your overall setup. It’s a little thing, but it can be a big deal when you’re trying to focus on your art. Also, consider the size of the pedal. If you’re a big guy, you want a pedal that you use easily rather than having to search around for it. It can also make a difference with how much pressure you should use to keep it going. Look for a heavy-duty product that won’t get kicked around. Both the tattoo machine and the pedal are the business ends of your work. A high-quality tattoo pedal is made of materials that can handle the constant pressure. Take a pass on any cheap, plastic products. You need something that is sturdy and durable to get the job done. Take time to examine the pedal. Look at the terminals and screws for the input connectors as well the wires themselves. They should be easy to adjust and stay put once they’re in place. You should also opt for heavy-duty wires that can take the abuse of everyday use. We looked at models with both the two-wire connectors and a single connected cord. There weren’t any outstanding differences between the two. If you can tighten the terminal screws down all the way, either type will work just fine. Just because it’s a foot pedal, it doesn’t mean you have to stick with something boring. It’s part of your brand. If you want something that makes a statement, go for it! If it’s functional and does the job, that’s all that matters. But, like anything else, the shiny finish will only last so long. The good thing about tattoo foot pedals is that you can find a decent model for an affordable cost. While we don’t want to call it a disposable item, it does take a lot of abuse. Make sure it’s a solid piece of equipment, and you won’t go wrong. When you get your tattoo foot pedal, take the time to set up your tattoo station using your new toy. It’s a good idea to unravel the cord before you use it. Connect it to your power supply and tattoo machine for a dress rehearsal. Position the foot pedal within easy reach. Also, give the pedal a try as you run your tattoo machine. Get to know how responsive, i.e., touchy, it is before you start on a real job. And go ahead and give it a workout to see how it performs. Take note of how much pressure you need to apply and how it handles. And don’t forget to pay attention to how the foot pedal feels while using it. If you’re noticing any ankle or even back pain for short run, it’s not going to be pretty when you’re on a long job. It’s also a good opportunity to tweak your setup to make it work best for you. This video from Pirate Face Tattoo shows you how to set up your tattoo machine and connect it to your power supply. It discusses the entire process from loading needles to connecting your tattoo pedal along with some troubleshooting tips to get you up and running. ​A good foot pedal is essential to anyone that's serious about tattooing, as they give you the full control you need. 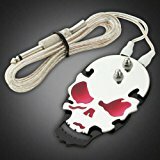 Foot switches are generally not that expensive to buy, but if you have to lay out all the money required to set up a tattoo shop, then you don't have the margins for wasting your money on junk equipment. Our top 5 picks list above offers 5 different switches that all offer value for money some way or another, it's up to you which one you think meets your inking needs. Now it's time to ​stick your foot down and put the pedal to the metal!